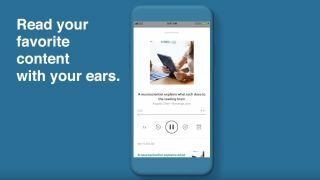 Listen is powered by Amazon Polly - a text-to-speech service that uses machine learning to convert type into lifelike spoken words. It's available now for iOS, Android, and as a beta for web. Mozilla has also given the app a visual redesign, paring back the interface so you can focus on the pages and stories you've saved. Pocket presents a list of suggested articles called Pocket Recommendations. when you open a new tab in Firefox, and earlier this year, Mozilla began experimenting with sponsored Recommendations. These are essentially targeted ads, but unlike many web services, all of Pocket's targeting is done within your browser. None of your browsing data is sent back to Mozilla or any third parties. It's possible to disable Pocket Recommendations completely, or turn off sponsored posts through the browser's settings menu.